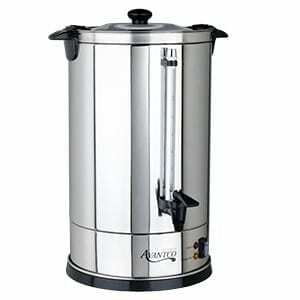 The coffee urn rental is 23 inches and made of polished aluminum. Standing on its stay-cool base, this big coffee maker is ideal for a buffet line, office event, or any other large scale event. It percolates up to 100 cups at a cup-a-minute rate and then automatically switches to keep-warm, serving temperature mode. Therefore when the light goes on and the spigot shows off its no-drip capacity, it is perfect for spotless cup-and-saucer use. Lifting the spigot provides a continuous flow for filling coffee servers. This units cover locks in place to prevent accidental spills. **Notes: this rental requires power, plan accordingly.